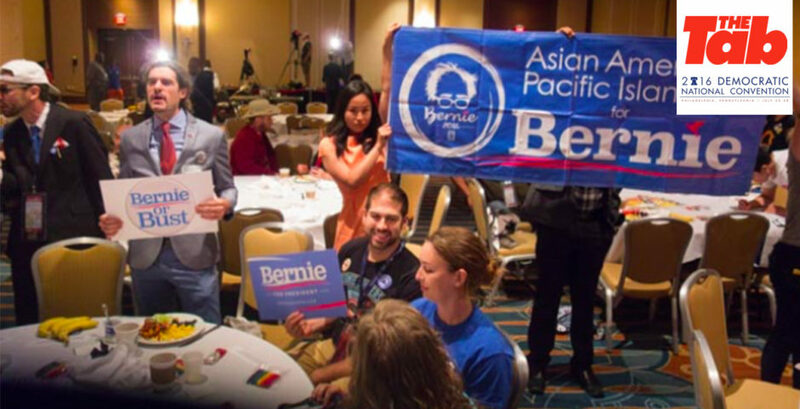 PHILADELPHIA — On a day themed “United Together,” the Democratic National Convention kicked off with a rocky start at the California Delegation breakfast, with delegates and supporters for Bernie Sanders openly protesting against breakfast speakers. The Bernie coalition broke out chanting “count the votes” and “do your job” during speeches by California Secretary of State Alex Padilla and House Minority Leader Nancy Pelosi. 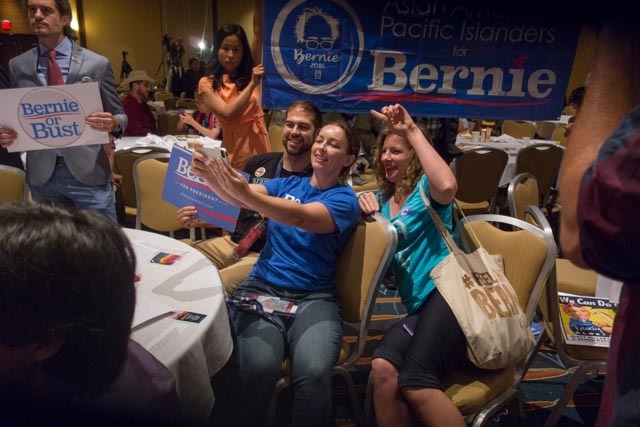 Ignited by Friday’s DNC email leak, Bernie supporters were livid, decked in full Bernie apparel and signs, ready to crash any demonstrations of support for presumptive Democratic presidential nominee Hillary Clinton. Actress Shailene Woodley attended the breakfast, hosted at the downtown Marriott, as a sign of solidarity with the Sanders coalition. “Our main objective is to keep Trump out of office, and the candidate who is most likely to keep Trump out of office is Bernie Sanders, not Hillary Clinton,” Woodley told The Tab. And show up they did. In the wake of the email leaks and DNC Chair Debbie Wasserman Schultz’s resignation yesterday, Bernie delegates doubled down on the long-standing assertion that the system is in fact rigged. “We’ve pretty much known this all along even before these emails were leaked that there’s been suppression against Bernie,” said Eric Reynolds, a pledged delegate for Sanders. Although the emails did confirm that the DNC worked in favor of the Clinton camp, Sanders supporters echoed the fact that they successfully infiltrated the system in reverse, evidenced by the undoubtedly progressive party platform. “They were saying that this is our most progressive platform ever. Pelosi just named off every single thing that Bernie Sanders was fighting for, and guess what? At the rules committees, not one Hillary person proposed any rules. 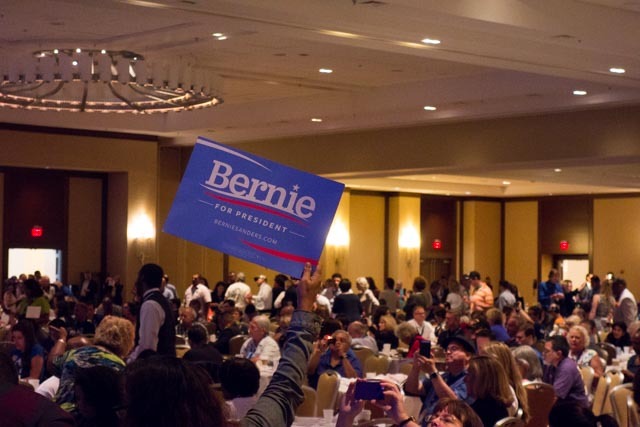 It was just Bernie Sanders supporters, and Hillary people showed up with their little packets of what they were supposed to say,” said delegate Jonathan Schnitzer. Despite this victory, Schnitzer lambasted Clinton’s choice of Tim Kaine as a running mate as a “giant middle finger” to the Sanders coalition. “Tim Kaine is the Mike Pence of the Democratic Party,” Joan Mao interjected. 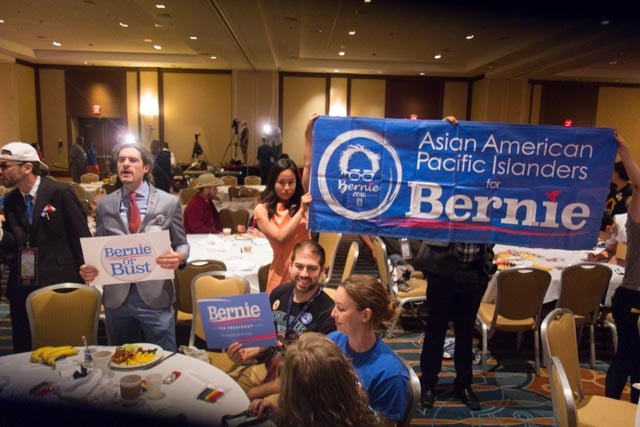 Mao, who came to Philadelphia from California simply as a Sanders supporter, sat with fellow Bernie delegates, leading chants with the disenchanted Democrats. Prior to Sanders’ campaign, Schnitzer was not a Democrat. Given the corruption exposed over the last few days, Schitzer said that he has very little impetus to be a Democrat after the Sanders campaign officially ends. The Sanders coalition effectively has 36 hours before Clinton officially secures the Democratic nomination. While the statistical odds of Sanders winning are effectively zero, his supporters remain confident that they have started a movement which will transcend election cycles and perhaps even party lines. “When I was going door-to-door in Nevada, Trump supporters, as long as they weren’t racist, we’re really easy to flip. And it’s only because they’re angry, they’re scared, they’re workers upset with the TPP and these trade positions. When I started talking about Bernie Sanders, they would go, ‘Yeah, that makes more sense.’ It was amazing to watch not only how quickly they would see what Bernie’s all about, but some would be at the volunteer office the next day,” Schnitzer said.